UHURU, Cyclone Lounger, 2010. 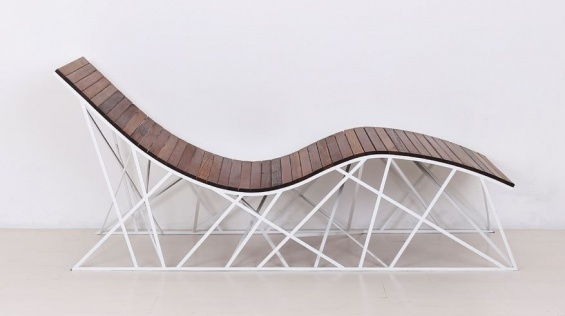 Reclaimed Coney Island boardwalk (ipe) with laser cut powder coated steel base, 69 × 22 × 39 1/2 in (175.26 × 56.9 × 100.3 cm). Founded in 2004 by Rhode Island School of Design graduates Jason Horvath and Bill Hilgendorf, UHURU (ooh-HOO-roo) is a multidisciplinary studio merging avant-garde design with a commitment to environmental sustainability. Join Horvath and Hilgendorf along with Karen Wong, Deputy Director, for a private walkthrough of their Red Hook studio and a conversation about their inspiration and process.